Do you remember this awesome party? 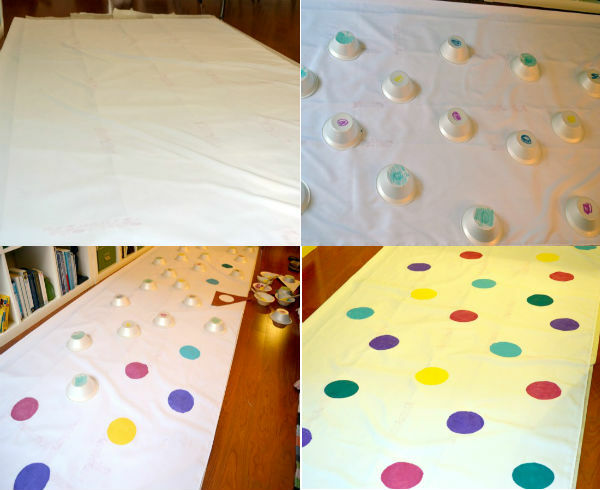 At Charlee’s 5th Birthday I painted this polka dot tablecloth, as well as some striped ones. Since the original post was lost, I thought I’d re-create it here. I won’t lie– this is a time consuming process. It took me 2-3 times more time I expected. 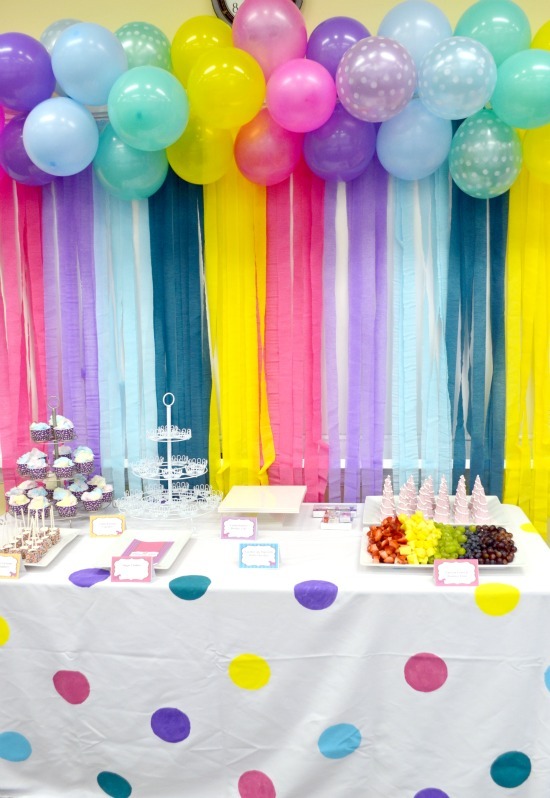 But the results are awesome– so colorful and fun. I was sad to see them go at the end of the party! First I washed and dried the tablecloth (I got a blend, part cotton to make it a little stiffer) and laid it out on the floor, on paper. Since I was working with so many colors, I marked bowls to lay out the color and the look, giving it that perfect, but not too perfect, randomization. I made a circle stencil for each color, and used acrylic paint to make the dots. Pick up the stencil quickly, so it doesn’t dry to the tablecloth. Let the tablecloth dry overnight. 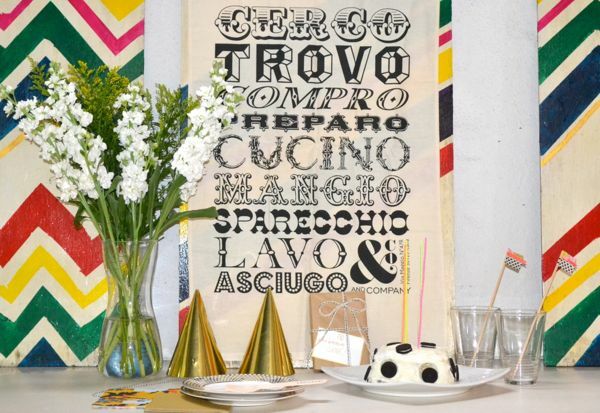 Drape it over a table and get ready for the compliments! One of my good friends celebrated a birthday this week, so even though it was wet and rainy, I had her over for a little cake and tea. 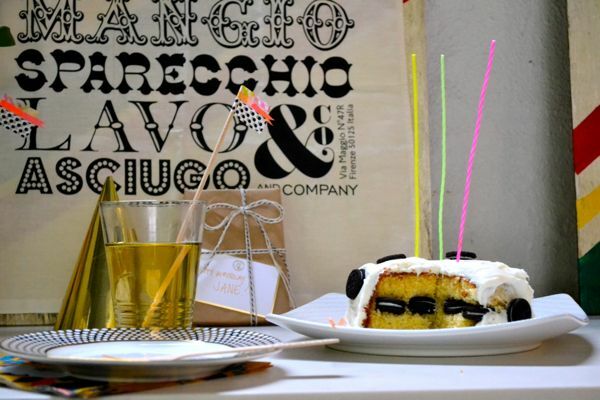 I used a tea towel for the backdrop, one I got in Florence, Italy. I don’t remember what is says exactly, but something about preparing and cooking food for enjoyment, love and family. 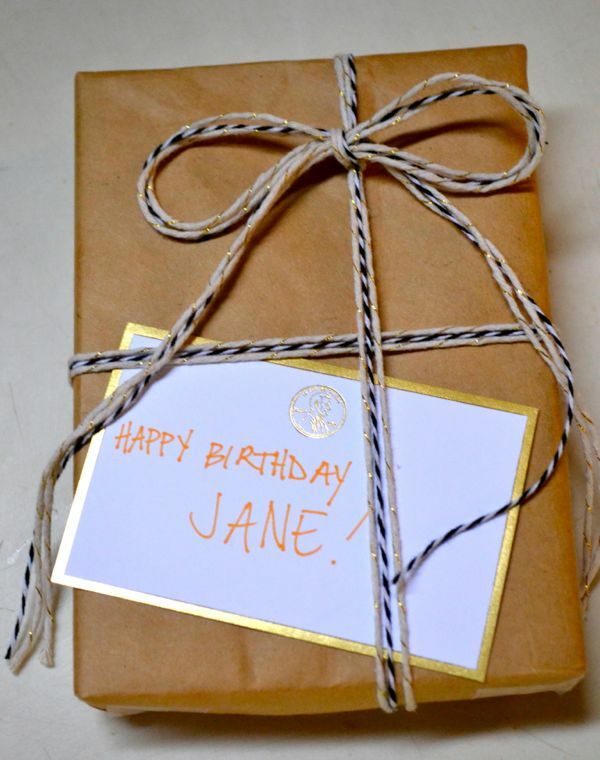 I found these simple gold birthday hats at the grocery store and livened them up a bit with twine. 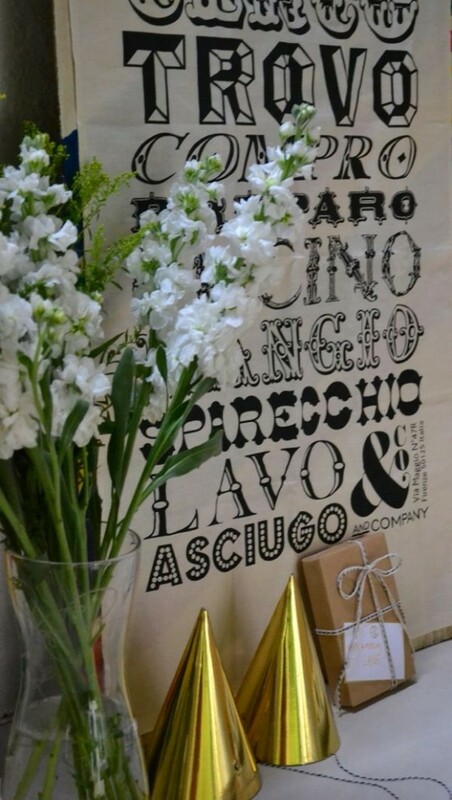 I also grabbed the beautiful white flowers to freshen things up. 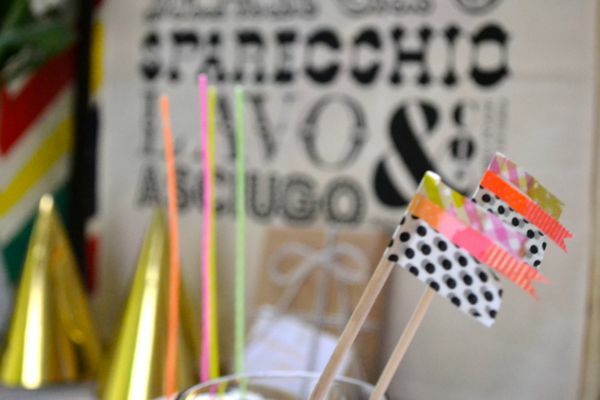 I really loved these washi tape stirrers with the pop of neon color. You just can’t beat washi! 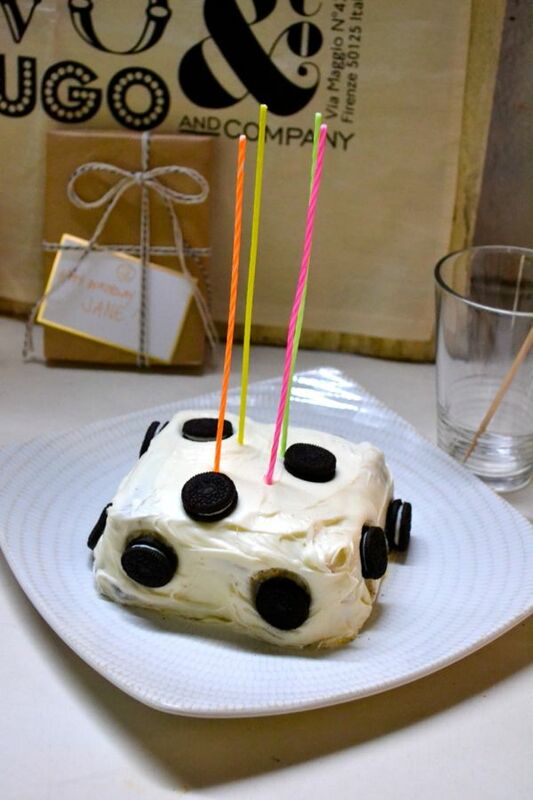 It was just the two of use, so I made a little cake, and spruced it up with mini oreos. Not heathy, but oh so good with the yellow cake. And I made the T2 quince tea that mentioned in my last post, which was a big hit. Overall, it was a fun afternoon, even dodging the rain. That being said, there were some great ideas floating around the web world in February. Here are some of my favorite and I hope you like them, too. 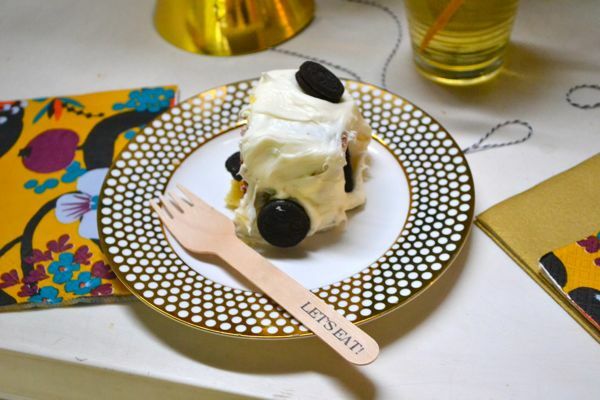 Food station wedding buffets– but nothing beats that sign. I had to follow this board, with its Event Lucky theme. These carrot stamped DIY dish towels are adorable. The wrapping, too. Since we’ve missed out on each other’s recent lives, I wanted to give you a snapshot of some our celebrations lately. December was busy with birthdays, advent activity calendars and holiday cards (we created our own! )– then we headed to Australia for Christmas and New Years. 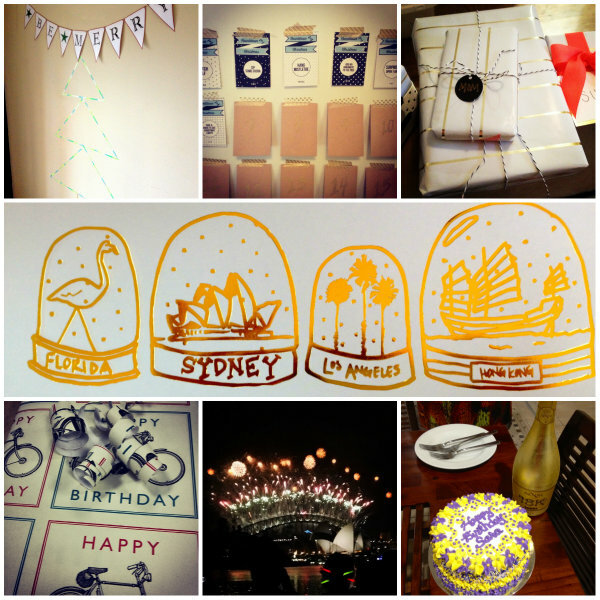 I decorated our beach rental then we headed out to watch the fireworks in Sydney, over the Opera House. 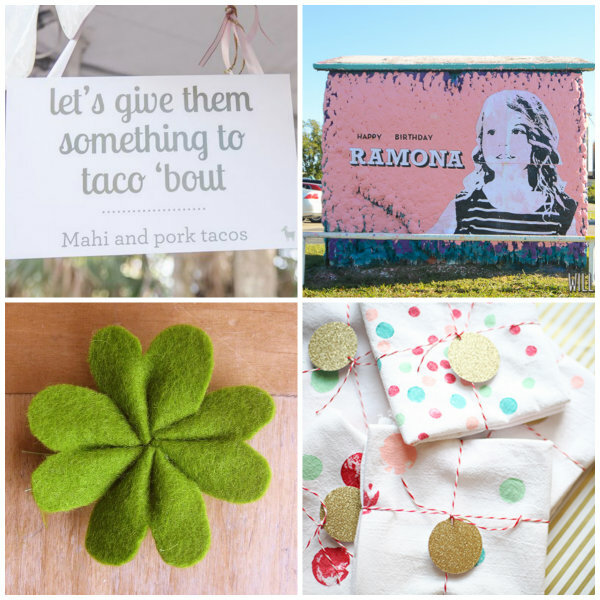 It was a jam packed month but full of wonderful!